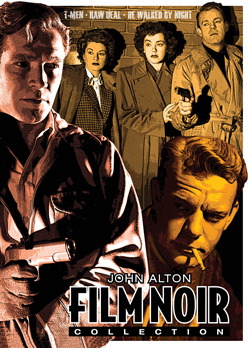 No other individual defines the foreboding film style known as noir more than John Alton, the Academy Award®-winning cinematographer (An American in Paris) who established his reputation as one of the movie industry's finest by plying his unique talents in the arena of B-movies. It was his work at Eagle Lion Films in the late 1940s, particularly his collaborations with director Anthony Mann which showcased Alton’s unsurpassed mastery of low-key lighting and bold use of shadows and darkness, that made Hollywood take notice. 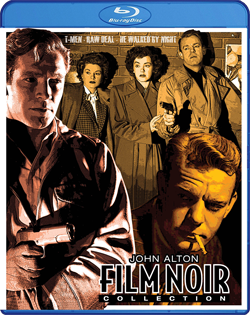 Though his film work is later represented by such iconic noirs as Border Incident and The Big Combo, the three features in this collection present the incomparable John Alton at the peak of his art. The initial pairing of Anthony Mann and John Alton resulted in this classic noir actioner, with a pair of dedicated Treasury agents (Dennis O'Keefe, Alfred Ryder) assigned to infiltrate a Los Angeles counterfeit ring. Spotlighting a first-rate supporting cast that includes noir icons Charles McGraw and Wallace Ford, T-Men transcends its low budget pedigree by utilizing highly stylized camera angles along with Alton's trademark light and shadows to accentuate its gritty urban realism. Fresh off the success of T-Men, Mann and Alton upped the noir ante with this tragic tale of a convict (Dennis O'Keefe) whose prison ""crash out"" turns complicated when a romantic triangle develops involving the two women (Claire Trevor, Marsha Hunt) along for the ride. Featuring character veterans Raymond Burr, John Ireland, Regis Toomey, and Whit Bissell, Raw Deal skillfully places a fatalistic love affair against the backdrop of a fog-shrouded nightmare that offers little chance of escape. Alfred Werker directs this groundbreaking police procedural that focuses on the manhunt for a cop killer (Richard Basehart) by a pair of doggedly determined detectives (Scott Brady, James Cardwell). Alton's cinematography is positively stunning, and He Walked by Night also features a key contribution from actor Jack Webb (as a lab technician), who used his experience on the film to create the seminal television crime drama Dragnet. Anthony Mann, believed to be responsible for directing the films most of the iconic scenes, is uncredited. Co-written by John C. Higgins and Crane Wilbur.